Tag Archives for " Tweets "
One of the things that seems to be happening with many of the new online tools is integration. As users start to settle into how they plan to use Facebook, Twitter and LinkedIn, each of the tools seems intent on providing access to the other to allow you to do most of your work from one platform. Keeping up with multiple platforms is tough, but gathering as much data about the folks you do engage is very helpful. For those who choose to use LinkedIn as their primary networking site there is good news. This week LinkedIn pushed even more Twitter integration into the Tweets app making it possible to add Twitter streams for all of your connections on LinkedIn. In fact, this moves the LinkedIn application towards being a full fledged Twitter client as you can also create groups and reply and retweet right from LinkedIn. If you have not done so, first you must install the Tweets application. Once you do that the Overview tab on your home page will allow you to see everyone you currently follow on Twitter, view their Twitter feed, and Tweet from your own account. You can also find other Twitter users to follow, based on your LinkedIn connections. 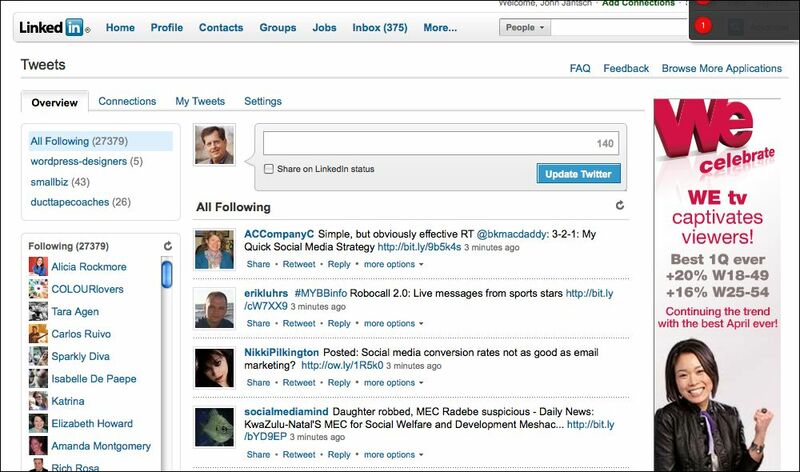 This deeper Twitter integration should make using LinkedIn a richer experience for current users and create a great deal more sharing on the site. Here’s another LinkedIn tip I borrowed from Chris Brogan. Keep up on the status updates and network news from your LinkedIn connections by subscribing via RSS (see that little orange icon) and checking in on your RSS reader. I don’t know about you but I find this way more convenient than going the LinkedIn site and trying to read what’s been going on.